This short 3-episode OVA tells the story of the SRW OG cast after the events of SRWOG2, who undertake a new mission. 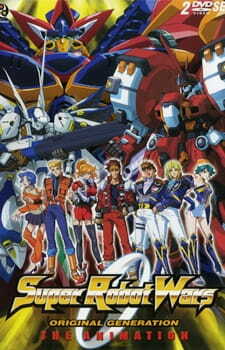 A word of warning before watching this OVA- it is targeted at SRW fans, not at the general public, and as such is highly confusing to anyone who hasn't played both SRW games (and is still confusing even if you have, as there are some minor differences that the average player may pick up on). Even if you have seen the other SRW anime, Divine Wars, there is a high chance that you'll have no idea who half the cast are, because most of them are introduced in the second game, which is not covered by the DW anime. What I'm saying is this: Divine Wars covers game 1 and this OVA takes place AFTER game 2, so there is a BIG gap if you only watch the anime and don't play the games. As a matter of fact, watching this OVA can significantly spoil alot of major events in game 2- I know, because I made the mistake of watching this OVA while I was only halfway through game 2. So that's the foreword, unlike the DW anime, this short OVA takes no effort to introduce the cast and just thrusts the viewer in. The story isn't too bad, it's a bit unbelievable- even by SRW standards- that the new enemy was able to produce as many units as they did but otherwise is a fairly coherent sequence of events. However, I believe the OVA tries to too do much. If the cast had consisted of no-one other than Bullet, Kusuha, Kyouske, Lamia, Masaki, Excellen and the crew of the Hagane, then it probably would have worked better, but because this was obviously made to appeal to fans, it attempted to have nearly every character from OG2 in it- which cluttered the OVA with loads of characters- most of which were lucky to get more than one line of dialogue. This is probably the story's weakest point, but overall they didn't really do a bad job with the story, it was just a tad unorganised and rushed. I really didn't like the art. Ironically, the party where most anime look awkward, the blending of CGI (mainly used on the enemy mechs) and standard anime drawings (everything else) was done quite well, but the normal things, like the SRX's combination sequence, looked sloppy. Rather than snapping apart and crashing together, the mechs just sort of "blended" together. This pretty much defines what I didn't like about the art of this OVA- it wasn't rigid enough. Now that sounds strange, I know, most people want fluid movement rather than rigid movement, but in this case it just looks out of place. Maybe I've played too many SRW sprite-base games, but it just came off as odd. The second major flaw I found was the battle choreography. The first couple times I saw Kyosuke's Alteisen reise get hit by a bucktload of missiles, I was like "ok, so his mech's pretty strong" but after seeing it happen over and over again, I started to just think that surely he was a better pilot than that. Ditto with Bullet's Grungust- It really didn't put up enough of a fight. Now, this was most probably done to take the spotlight off them for a minute so that someone else had a chance to blow up the enemy, but it still struck me as just not quite right. This was probably the biggest disappointment, the music is rather subdued and the voice acting is pretty poor. Essentially the only complaints I have are with "Ratzel"'s theme and Sengar's voice- the former was slow, muted, and not as epic as his game music is (you should all know THAT track), while the latter didn't bellow with epic guts- it sounded like he was talking with a blocked nose. Now, sure, two people out of a whole cast isn't much, but considering these are like, the two coolest people in the whole show, it stood out. Either way, the rest aren't good enough to make up for it. DW and the PS2 game did a vastly superior job with their voice acting and BGMs. As I said before, the fact that they try and include nearly all the characters is pretty bad, there just isn't enough time to do it right and alot of them barely get two lines between them. Furthermore, some characters, like Mia, who was piloting the R-Gun in the game, isn't piloting the R-gun in the OVA, which is understandable, and probably justified in one of the remakes of the second game- but without having played those games (they are japanese only) I can't really say the OVA did a good job, it just bit off more than it could chew. Also, alot of mechs are missing, mostly because their respective pilots never get a chance to use them (due to plot reasons), but still I would have liked to see them. I mean, it IS super robot wars, we ARE here to see the mechs- replacing them with (slightly customised) mass-produced units was pretty disappointing. Overall, this OVA was pretty flawed, it thrusts the viewer into the deep end but hurts its plot by including too many characters, while not being polished enough for a fan to really get excited over. It doesn't manage to be "bad" per say, just in need of a good deal of refining. In my opinion, Divine Wars is a much better anime to watch, as it has a good plot, pace and progression, but as it only covers the events in the first OG game, it doesn't have alot of the mechs and characters that crop up in the second game. Alas, they really need to make an anime of OG2. That would be freakin' epic, but in the meantime, this OVA isn't a terrible first attempt at animating Super Robot Wars, and I would still recommend fans to watch it, but non-fans really shouldn't. Not without playing the game(s) first.